My blogging pal Angela over at The Coupon Project has once again come up with a Savings Tracker for you to keep track of how much you’re saving by using coupons each month. It’s also a great way to make sure you’re staying on budget for the month & see how much you’re spending. 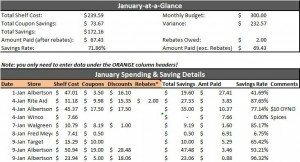 Angela is the queen of Excel spreadsheets, so this Savings Tracker is very professional & has quite a few features allowing you to track your savings rate, rebate information, & how much you’re saving by month & for the year. Make sure to head to The Coupon Project to see all the details about the Savings Tracker, how to use it & then you’ll be able to download it using Microsoft Excel or Google Docs. This is actually one of my goals for the new year to better track my savings from couponing. It will pair nicely with what we’re already doing with Dave Ramsey’s Financial Peace University class, where you keep track of every penny that you spend. This way we’ll be able to see not only how much we’re spending each month – but also how much we’re saving by being frugal & using coupons. While you’re there, make sure to check out her other handy free download – a guide to store sales cycles. This is based on her observations over the last two years & when items typically go on sale in the stores.